Your Barbie Doll House Plans: Searching for these kinds of plans too? Oct 2011. Doing any kind of craft for fashion figures I think just brings out the creative spirit in me. Does it you? I really do not know why these toys are so endearing to me. Possibly it is because as an eight year old I would play for hours with them and fashion my own version of their clothes as well. Around the age of eight or so they do tell us that we as children are developing our ways in life even then. What better career to be involved in: the writing about, playing with and enjoying of miniature houses. With Fashion House Plans in hand: It makes one know that at any time they can become a child all over again. Today lets review some to the different barbie doll house plans available in book form. These four barbie doll house plans books make me wish I were currently engaged in the physical creation of a fashion mansion. I do keep myself very busy with writing about miniatures but I do dream constantly of working with just about every book I review. I guess it's as they say: if I only had more time. But these four, above mentioned books, are quite intriguing. They have imagination and great looks going for them. You can as well get each plan separately. However it is worth noting that you can purchase the "Barbie Doll House Plans Book" mentioned at the top of the list and get the bottom three plus the furniture issue included. So purchasing them that way you do save some money. Plus the first book comes with an enthusiastic customer review of someone who has used the book and loved the results. However what I love most about books like this: You can study the techniques at your leisure and gain valuable tips and ideas to help you fashion your own Barbie Doll House Plans. Exploring what and how others do things is the ultimate way to accomplish great designs of your own, as far as I am concerned. "My sister and I purchased this book for our dad to build mini houses for our girls. I LOVE THE DOLLSHOUSE!!!! He built the biggest house. It did take him a long time, but they turned out awesome!!! The houses will definitely be in the family for many generations. He does plan to build the other ones in the future....I am sure they will be awesome too!!!!" At present, I am constructing a woodworking area in my basement... these designs will definitely be on my fun to-do-list in the near future. Will they be on yours too? In the next examples of these great plan books, I could not help adding a couple extra choices just so you can continue to develop your own design skills even more. Remember: Never copy someone else' designs but always use what and how you see stuff applied to develop your own ideas even more. Below select any plan book you want. Use the "Go" button or click your choice to get more info when needed. These selections take you to a new page. For More Info on Developing better Designs check out this article "Fashion Designs: Your Road to New Heights" found here. 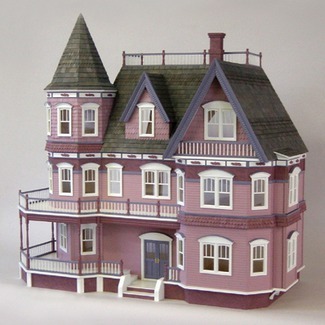 Also check out this article I recently wrote for EzineArticles.com "Barbie Doll House Plans: How to Create an Original Design"
Don't forget to investigate the last several month E-Zine Issues that look into different topics related to miniature creation. Check those issues out here. For this month's miniature project I thought I would do a mini form of something we entertain with at times. I am going to take this item from of my accessories wish list and make a playscale Maid and Butler Uniform for mini wine bottles. Join in the fun and create your own mini item along with me. The craft with this issue is the making of 1:6 scale wine bottle decorations. For the times when your special fashion figure is entertaining all her celebrity friends. This craft can be incorporated into any current Barbie Doll House Plans you have on the go. Step 1: Decide on the color and style of wine bottles you desire. Step 2: Begin softening your clay. When it is sufficiently soft form it into tiny playscale size bottles. Step 3: Bake the bottles in a 265 F oven. Step 4: Add the decorations and any added idea you have. You can easily add anything you see on your own wine bottles at home. Use them as an example and create your masterpiece to suit your style and taste. View or Buy Mini Bottle Bibs in Playscale. Why would a person say: "The Queen Anne Kit is not for the Faint Hearted but for the Truly Committed Collector"? Reason #1: For the most part just viewing this amazing mansion and one has to see right away the amount of true commitment one has to have on board to purchase a project like this. Let alone to finish it in its entirety. Reason #2: Then I have to say that someone just starting out in the miniature hobby should not buy this kind of massive project until they truly feel that they know what they are doing. That said there are individuals who learn really quickly so go for it if you think you have the skills. Reason #3: This is a project that requires a definite cost commitment as well. The fabulous list price of $1081.24 should make those that may not be ready for it think a bit more before purchasing. Check for sale on Real Good Toys Queen Anne Kit now. Free EBook Offer 10 Important Tips to Great Dollshouse Design! Get our new free ebook today. Learn how to start your future barbie doll house plans project with the enthusiasm it and you deserve. Your Fashion Designs Barbie Doll House Plans made Easy. Choosing the route to take for true fashion construction just got a lot easier. Come along and see how you too can create the houses you've always wanted.